In addition, there will be a benefit auction at the Brazos Bash (September 23-October 2), with proceeds split equally among Cyndy, J.B. McLamb, and Horsemen for Christ. There are times in everyone’s life when they encounter unexpected difficulties. 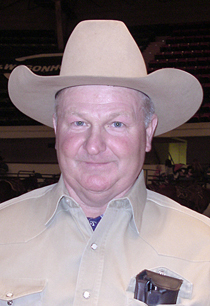 This is such a time for NCHA Hall of Fame Rider J.B. McLamb, of Weatherford, Texas. Following his double knee replacements, he has developed an infection in one knee which will require him to undergo further surgical procedures and treatment for the infection. He will be unable to work for several months. As with most of us, extended time off work makes it difficult to meet financial obligations. J.B. is not the kind to ask for help, and is even considering selling his and Ginny’s ranch and home in order to make it through this tough time. That does not need to happen. This is an opportunity for J.B.’s many friends to finally be able to help him as he has so willingly and tirelessly helped us in the cutting pen. Whether you have been the recipient of J.B.’s expertise at a weekend show or the biggest aged event, you know how freely he donates his time. A group of J.B.’s friends have set up a bank account that only he and Ginny can access. Know that every penny will go directly to them, and all donations are anonymous. When you think of all the times you have had J.B. in your corner, think about giving back the cost of one of those classes to help him now. Whether the amount is the cost of a $200-added or a big time aged event entry, it will be appreciated. 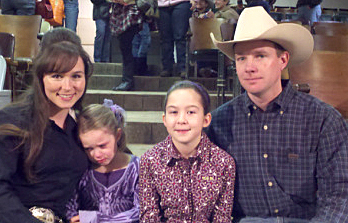 Jason and Sarah Forby, with daughters Emma and Shae. The Jason Forby family from Goreville, Illinois lost their entire cutting horse operation, including horses, tack, and Jason’s livelihood in a barn fire January 31. Jason, his wife, Sarah and their two daughters ages 5 and 11 are starting the rebuilding process. A Benefit Auction will be held in the Miller Coliseum at the Murfreesboro Tennessee Show and Professional Auction, from noon February 11 through 6 p.m. February 12, 2011. All proceeds will go to the Forby family. A silent auction is being held to help offrset medical expenses for Tim Barry, who has been hospitalized since last Friday, when he suffered cardiac arrest while performing in the second go-round of the Non-Pro Futurity. The auction will close during the last cattle change during the Open Semi-Finals, on Friday night, December 10. Contributions are also being accepted at the Horsemen for Christ booth in the Exhibit Hall. There will be a benefit auction and dinner for Sheila Madariaga January 16 at the Cantina at Silverado on the Brazos, Weatherford, Texas. There will be a silent auction throughout the day Friday and Saturday at the Silverado Cutting. There will be live music by Katy Keenie at 5:30 p.m. Saturday, followed by dinner and a live auction. For more information, contact Jody Hatchett (901) 634-5090, Sarah Morine (817) 771-4748 or Shayle Allen (817) 304-1957. There is still time to make an online bid with LOPE Texas. Proceeds go toward the winter hay budget for the Texas home for ex-racehorses. Click here or go to http://lopetexas.typepad.com/horse_tales/ for more information. Western States Cutting Horse Association auction proceeds help fund WSCHA Youth Scholarships. Contact: Todd Adolf @ 970-395-0520 for questions or e-mail at cutting@mcclureranch.com� Make checks payable to: WSCHA, and send to: 26849 CR 388, Kersey CO 80644. Click here for details.